So, with a wounded back, I laid on the couch watching Deadliest Warrior re-runs and pondering if a Ninja really could beat a Spartan. After seeing the evidence, it was clear and I was damn hungry and unable to go anywhere. Long ago, I hurt myself stopping a greyhound bus from blowing up. See, if the bus went over 50mph it would explode and if it went under 50mph it would explode. So I had to get to work, jump some freeway gaps, do a few tricks with the camera and then get all the people off the bus. Anyway, I hurt my back while doing a double take at how Keanu Reeves became a popular actor. So I’m laying here and since I had a friend coming over I begged and pleaded for her to bring me something to eat. I actually didn’t have to beg all that much. She’s really nice. So she brought me food from…..wait for it……wait for it….. Jabal Lebnan. So this was my first taste of Lebanese food. I was excited. My friend brought me Beef Shawarma, rice, the house salad, garlic sauce, and hummus. 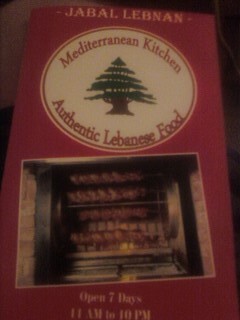 I also got to try the falafel, fresh pita bread, and some of their chicken. I love throwing everything in a pita and eating it like a taco. You can easily do it with this stuff and it’s really good. I loved the flavor in the beef. Though it was a little drier than I normally like it, it was still very good. I know almost nothing about middle eastern cuisine so it was a real education for me. I was trying to pick things out and garlic was very prevalent along with lemon juice and maybe some allspice. There was a sauce to try and it tasted like it was yogurt-based. It was also very good. I loved the long rice and the veggies too. The falafel was not for me. I’ve heard that they are very popular and I say have fun. I’d rather get in a falafel ball fight with them. I’d love to get a gun that could shoot them. I guess I’m just not into hard crunchy fava beans and chickpeas. I’ve had hummus before at a couple Greek places and theirs was pretty good. It seemed to have all the basics: garbanzo beans, parsley, lemon juice, tahini. It was good. But just like mashed potatoes here, I imagine if you can’t make hummus over there then you need to move to New York and live with Zohan. So Lets Go! Just a side note: tahini is a paste made from sesame seeds. The seeds are hulled and roasted. This stuff is big apparently (not Oprah final episode big, but at least American Idol Big). From the look of the menu they have plenty of dishes, a wide range of prices, and they even do the Hookah thing. I’m a cigar man myself, but if you people enjoy it, Hookah yourself crazy. For those of you who are really into Mediterranean, middle eastern, and cuisine from that part of the world, hopefully you can give some more insight. The only thing I can do is tell you I liked it. I’d go there for sure, and I would love to try some other dishes minus the falafel. I think they buy their pita bread rather than make it, so maybe someone else who has been there can confirm that for me. If you’re in the area and want to experiment give Jabal Lebnan a try. Maybe my friend Bernadette can give you some more insight on the customer service, because this was simply delivery for me. It was brought right to me with a smile and it allowed me to contemplate why Keanu Reeves is still getting work. Thanks again to Bernadette for bringing me dinner (and great customer service). I’m hopin’ she becomes our sideline reporter for EMC so we can really start widening our turf.